A meditation technique where one focuses on the field or background and embrace all the perception around that field is called Mindfulness Meditation. It is in contrast to another meditation technique called concentration meditation, where one channels all the energy and focus on one specific object or subject, blocking all distractions around. For instance, a person using mindfulness meditation can focus on his or her breathing, while at the same time incorporating other senses around him or her, like the sound of leaves on swaying tree branches nearby, a faint music playing, or the perception of movements from other people from a distance. The meditator incorporates his or her breathing in harmony with these surrounding senses. In concentration meditation, the meditator holds attention on a single specific focus of thought, which could be a prayer bead, or a thought-based anchor for concentration like a mantra or repetitive prayer. There is no argument on which of the techniques is better. Those who have developed a higher level of concentration also shift easily between mindfulness meditation to concentration meditation or vice versa in a single meditative session. While concentration meditation trains the mind to withdraw all attachment beyond the self to develop full self-awareness, mindfulness meditation encourages the mind to recognize elements beyond the self to be able to know the whole self as a constitution of all the other elements. Instead of being distracted, the meditator should acknowledge the existence of things beyond the self and incorporate it in harmony with the awareness of existence at that particular time and space to get a holistic perception of self. 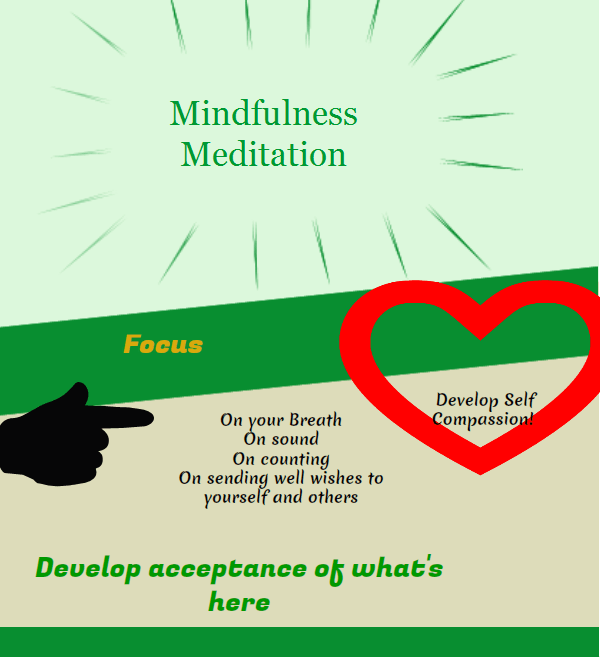 Mindfulness meditation has a similar concept in the religion Buddhism, which also gives high importance on the practice of meditation to achieve self awareness and clarity of the mind. This is the Buddhism meditation technique called Vippasana, which advocates for various mind practices for the purpose of developing insights and general wisdom by seeing the true nature of the self along with the true nature of the surrounding realities. This is in contrast to the technique Shamatha, which develops one’s ability to focus the attention on a single point, unobstructed other realities beyond that point. This is the counterpart of concentration meditation. In the western forms of meditation, there are concentration techniques devoid of any mystical or rigid religious beliefs. Still, mindfulness meditation finds it way in many of the modern schools of meditation, particularly in yoga, which promotes peace of mind by suspending realities filled with worries and fears, cleansing the mental state by invigorating mental relaxations and absorbing fresh perceptions like mind control, free will, and the presence of guidance and protection from a higher source. Absorbing these positive states of mind requires mindfulness meditation, as it recognizes surrounding elements that are helpful in developing a healthier and renewed perception of the self.